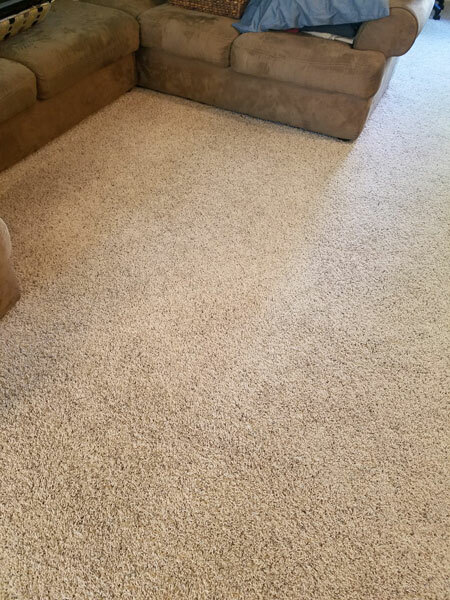 Here are some before and after photos of a residential carpet cleaning in at a Tampa FL. 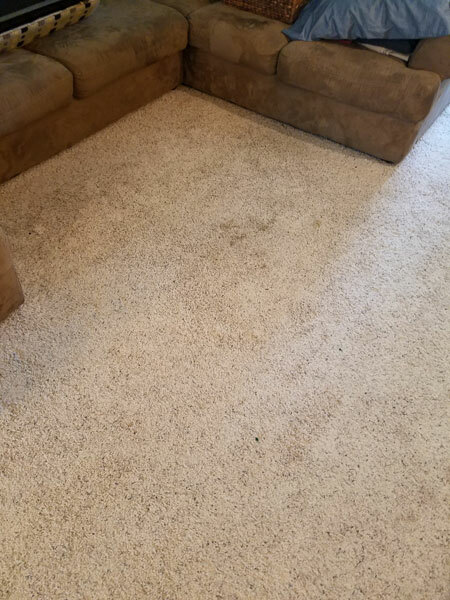 This carpet is only two years old and is showing signs of both wear and soil. This type of no traffic carpet does a great job of not showing traffic patterns and reducing the foot prints in the carpet. On the other hand due to its crimped nature it does attract more soil than other carpets non stuffed carpets. Its recommended to clean these carpets more regularly to reduce soil build up prolong the life of the carpet. In Tampa FL there is a lot of sand that ends up in the carpet. Fine silica not only travels in on shoes and other articles brought into the home but it can easily make it's way in through the AC units and settle in the carpet. Carpet is designed to hold particulate matter in and keep it out of your breathing zone. This has obvious health benefits but it can add a lot of dirty and soil to your carpet. Vacuuming on a regular basis does a great job of removing most of the soil but the remaining sand will start to wear the bottom of the fibers. Over time the fibers get scratched and carpet gets harder to clean. That's why it's important to get your crimped carpets cleaned on a regular basis. I recommend a professional carpet cleaning about every 6 to 9 months to keep this type of carpet healthy and clean.